When bad things happen for the past nearly 5 years I've always come to my blog to vent and get all my feelings out, it might not be the right coping technique for everyone but it works for me. This often means sharing some quite heavy and personal things but I've always felt comfortable sharing things here, I'm never quite as honest as I am to friends and family though but today I really feel like I just to need to be angry and moan and be as honest as I can be. I don't know what to do, what to say, who to talk to so I'm just going to type and keep typing until I don't feel as crap anymore. Sorry this is going to be a negative post. Last month I found out more information about the tarlov cyst that is sitting at the bottom of my spine, sitting on nerves causing me intense and severe pain all the time and slowing eroding away my sacrum. I didn't see my actual surgeon at the time so the doctor I saw went away and my case was added to the MDT meeting, a meeting where all kinds of doctors come together to discuss tough cases. Today I had a follow up appointment regarding my hip replacement and the doctor who happened to be doing it was that same doctor that saw me last month so I was able to find out the outcome of the meeting. Today also happened to be the first time that I cried during a hospital appointment. Last month we were informed that potential surgery to remove the cyst would be risky but we weren't able to get too much information. Today it was confirmed, the risks of things like paralysis and incontinence were too high to proceed with any surgery. I asked to be referred to a surgeon I know of at Stanmore who is highly regarded in treating these cysts and it turns out his team had been part of that meeting and they had agreed that surgery was too risky. However, without surgery I risk fracturing my sacrum, nerve damage, increasing pain, numbness, bladder issues, the list goes on. Not to mention the fact that this pain means I can only walk a few steps around my house and even when I use my powerchair outside I am not able to sit up in it for long. 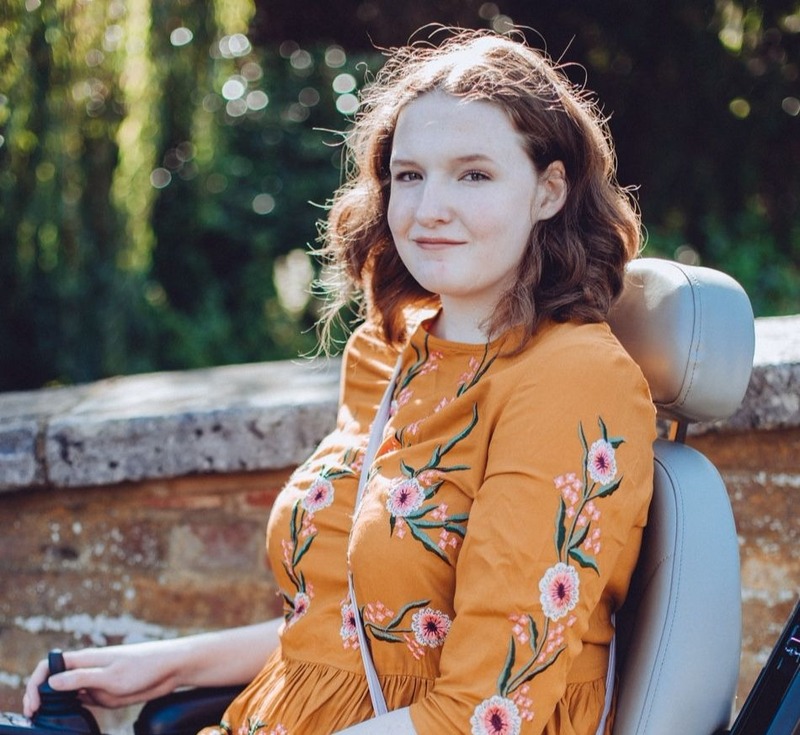 When I got my powerchair we had no idea about these problems and whilst it gets me from A to B and I'm so grateful to have it, it just isn't perfect for me and adapted for my problems. And now these people are telling me that there is nothing they can do and so this is basically for life. Long term I have no idea what this means, my oral morphine is already starting to have less effect so what happens when that stops working completely? I have already exhausted most pain relief options and the BuTrans pain patches I'm trying now aren't making any significant dent in my pain. I feel so abandoned. I've never come across someone with Marfan who like myself has had such a wide range of problems, I hate saying 'why me?' but I can't help but think it. It isn't just this cyst I have to deal with, I also need major heart surgery within a matter of years to replace my aortic root before it becomes a life threatening problem. I still need my left hip replaced but now that has become a much riskier procedure, the risk of my sacrum or hip socket fracturing is now high and the operation might have to be done a different way rather than the normal way my right hip was done. I still have pain throughout the rest of my body, dislocating and subluxating joints. Migraines. Fatigue. The leftover pain and stiffness from having spinal fusion. The list of problems feels never ending and I'm not sure how to cope with it all if I'm honest. I'm terrified about the future, a future full of pain, a life spent laying down. I'm trying to stay positive, I really am, but when it's just bad news after bad news I'm not sure how to anymore. I don't write this for sympathy for attention, I write this because I need to do it for myself. I don't want my blog to become a place of sadness or pain but I just really needed to vent so I hope you can understand why I had to write this, normal posts will be back very soon. Thank you for all your support, it means a lot. Firstly, I think it's entirely rational to be deeply upset by this news, so I wouldn't beat yourself too much about how you feel. They're your feelings and you deserve the right to feel however you want to about news that is bad, it will help to process and think through this difficult news. As I read this I was thinking about what I would do if I was in your position, and what would help me (not that I am saying it would help you) but when I get to my low points I try to focus on smaller periods of time in the future to make the difficult time more manageable. So rather than the far future that quickly goes to worse case, focus on today and tomorrow. If that's too hard, just focus on the next few hours. This might make those feelings of pain to come panic slightly easier. It may be too hard to ignore I don't know. Sometimes even a tiny foothold is enough to help me pick myself up again. I'd also be looking for a second opinion - there are always other perspectives on difficult operations, if your quality of life is so greatly reduced already there may be another who's willing to review this decision. Again, no false hope, but that's what I'd do. I don't know a lot about your condition, but could you reach out to any patient groups or other patients to find out if there is someone else with similar circumstances to your own? It might give new ideas or avenues for treatment. Just my thoughts, apologies if it's not at all helpful to you. Thank you for your advice, I already take things day by day but it's so difficult as right now I'm just getting bad news after bad news, the past 6 months have taken their toll me on. I'm definitely going to get a second opinion but even if I could find another surgeon who would say yes I'm not sure if I would go ahead because this surgeon that has said no is the best in this area of expertise and the only one who I would really trust as it is really risky surgery. I'm already part of groups for my main condition, Marfan Syndrome, but I've not been able to find anyone in my position with such a wide range of problems and all of the Tarlov Cyst groups I have joined are mainly full of americans who have access to an amazing surgeon over there, one that I wish I could see. Can you send your records to the doctor in the USA to at least get a paper review? I'm not sure, I suppose I could but means paying to access my MRI scans and notes and then if this American surgeon says he can operate then I just have to live knowing I could have an operation to help me but couldn't travel that far to have it done or afford it.